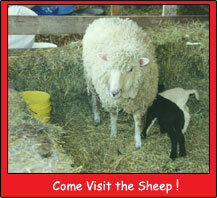 We have always had animals on the farm, but Annie the sheep was our first pet. We were treating her for hoof-rot and she moved into our back yard because she needed company. We now have three sheep and two goats. There are chickens and guinea hens on the farm. We also have two mules named Sally Blue and Kit. Our miniature horse is named Silver - she stands only 3 feet tall. We also have a horse named Red and a hinny named Samuel (a hinny is the offspring of a male horse and a female donkey). Stand by as we add to our menagerie!